Our son was due in mid-August, so for the last weekend of July (pushing it, I know), we'd planned a party to encompass our birthdays (both in late summer), our impending baby, and a belated housewarming. The day before we spent doing various things needed to get ready, cleaning and organizing our unclean and disorganized house. (Moving in takes a long time.) That evening, Hayley reported a fluid coming out of her... at first we weren't sure what it was, but it soon became obvious her water had broken, and she called the midwife. We met her at the birthing center in about an hour. The issue is that she wasn't having contractions yet, and the longer you go with a ruptured membrane, the higher the risk of infection. So we had to see if we could help the body and the baby along. It was almost anticlimactic, I think, to realize that within a day, the baby would be there or at least coming. Like, that's it? It's happening? The midwife gave us some tasks to perform-- we needed to adjust the baby's position slightly if we could, and we needed a laxative-- and we had some tasks of our own to perform-- we had never finished putting together the "go bag" of materials to bring to the birthing center! The natural way to induce a birth, it turns out, is laxatives. Your colon and your uterus are next to each other. Giving birth can cause you to poop, but pooping can also cause you to give birth. So we bought some castor oil and some ice cream, and I made what I assume was not a very good milkshake. The awkward thing is that Hayley had tested as Group B strep positive, which meant she needed to take regular antibiotics once labor started. So every four hours we had to go back to the birthing center for an injection, and our first trip there had been around 6pm! Thank goodness we live only 10-15 minutes away; there was a couple in our birthing class who lived about an hour away. I was able to get some sleep a few hours at a time that night, but Hayley didn't sleep at all. The castor oil did work. Overnight, while I mostly slept, contractions developed and intensified. Hayley was sort of on the cusp of active labor when we checked into the birthing center around 6am Saturday morning. I'm not sure if we technically qualified, but I think the midwife was starting to feel bad for us. The birthing center has a couple bedrooms where you can give birth, complete with shower, tub, and toilet. We spent a lot of time experimenting with various ways of helping labor intensify, including using a breast pump and walking around a lot. My mother got there that day; I'd called her the previous night because my wife had asked her to be there for the birth if possible. * We also had a doula in training. Hayley had actually made arrangements with a different one who turned out to be out of town that weekend, and another one agreed to fill in for her. I spent a lot of time recording contractions on an app on my phone, but it soon apparent that the contractions were petering out, becoming less and less intense, and more and more infrequent. So around 3pm, the decision was made to transfer Hayley to the midwife practice at Tampa General. One thing the birthing center required was that you bring a high-protein meal to eat after birth, so when we'd arrived at the birthing center, I'd thrown the ingredients for chicken and rice in a crockpot. We chowed down on this, and then headed out. Things never move quickly in hospitals. They move agonizingly anti-quickly at times. 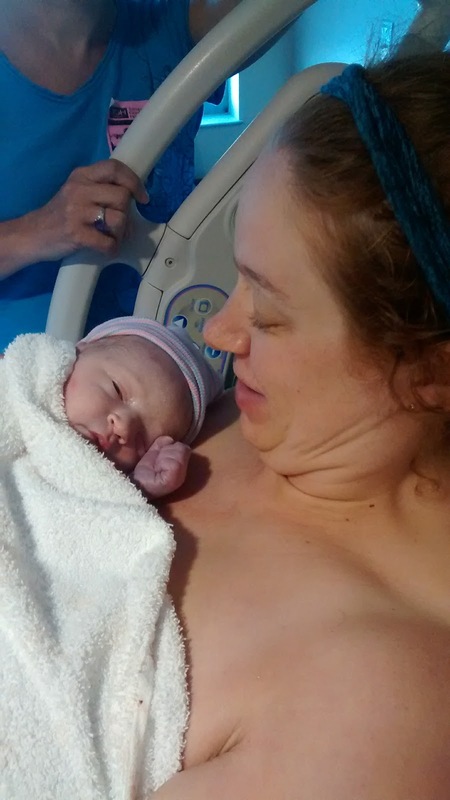 We sat there for ages waiting to see the hospital midwife, but finally we were admitted, and Hayley was given pitocin to help induce labor at around 6pm. By 9pm she was experiencing mild contractions, and we were doing laps around the floor. By 11pm, they were getting regular. Hayley and I were up all night, as was the doula; my mom was the one who actually got some sleep. I think I had ten cups of coffee across twenty-four hours. The contractions kept getting stronger and stronger, and Hayley rapidly began to feel like she couldn't go on. She was checked around 2am, and told she was only dilated to about 5 cm, and she was just in a complete state of despair. 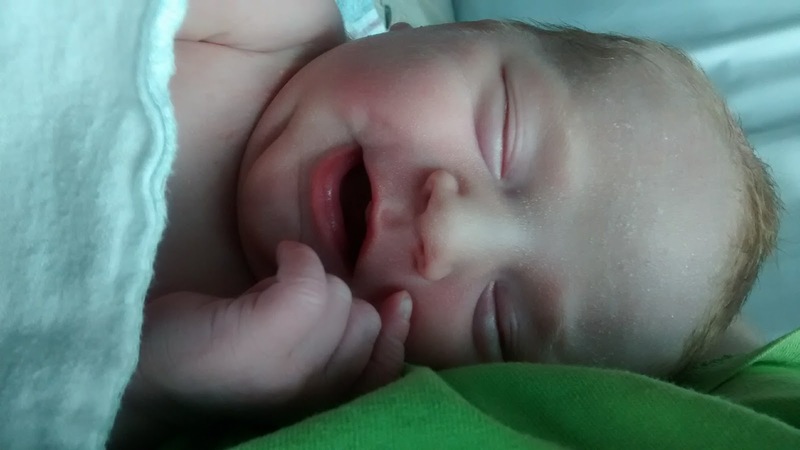 She'd been in labor for about twenty-four hours, and active labor about three, and she was barely halfway there! I actually found the whole Tampa General Labor and Delivery experience really great. We had easy access to food when either Hayley or the rest of us got hungry, including a coffee machine, and the night nurse was incredibly attentive and helpful, one of the best nurses I've ever encountered. Alas, it was her last day of work! Things got tough, though, when around 5am Hayley started to feel like she wanted to push, but she was not yet dilated enough to allow it. The doula kept telling her to breathe through it, but this was clearly not easy, especially as the longer it went on, the more she wanted it to be over with. It was around 7am when she was finally told she was allowed to start bearing down. I was surprised with how emotional I was at this moment. Hayley had been working so hard for so long, and she had done it. She was ready to have the baby. Relief washed over both of us. It had gone on forever, but it wasn't forever, and now the end was in sight. I was so proud of her. Birth is clearly hard work, the hardest she'd ever done, and she did it. I was certain I did not want to catch the baby, but I did stay behind Hayley (still on her hands and knees) with the midwives as she delivered the baby. I wanted to get a peek of that head with its red hair coming out. The midwife kept using a flashlight on her phone to get a better look, and eventually asked me to hold it. Then her phone started acting up, so I substituted my own. That was my big contribution to the birthing process as our son was finally delivered at 8:18am Sunday morning, the culmination of thirty-one hours of labor. A friend asked me what the biggest change being a father was. 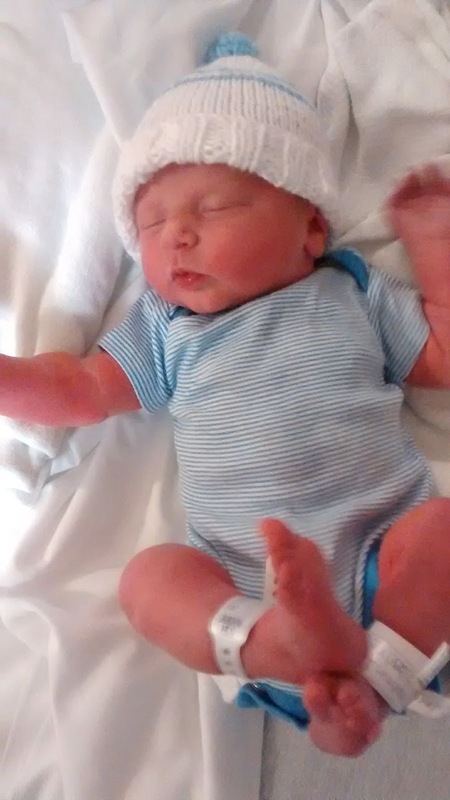 At this point, my son had only been alive less than a week. I know that my life will be reshaped in many concrete ways, large and small, but most of these haven't really set in yet. As I write this, I'm still between semesters, my wife is on parental leave, and we've had and continue to have a bevy of family here supporting us, which means that many of the practical considerations of child-rearing have not yet manifested. We'll see what I think when Hayley's mother is gone and we're both back to work! So so far, in a sense, not much. But in another sense, it's been really jarring. I was once not a father and now I am a father, two totally different things. The only comparable experience I have is being in romantic relationships, but that's gradual. Like, it's weird being a husband, but you don't go from being single to being a husband. You're single, then you're a boyfriend, then you're a fiancé, and then finally you're a husband. So things scale up gradually. But with fatherhood, one minute you're not a father and the next minute you're a father. And you have a son! What's going on? How did this happen? Who am I? I don't know when I will finally process this; it's still ongoing. I'm a person now I wasn't last month. Things moved very quickly once he was out, all blue-skinned and cone-headed. They immediately put him on Hayley's chest for skin-to-skin, but they were also reaching inside her trying to get the placenta out, which made Hayley incredibly uncomfortable. It wasn't clear to her or us why they were rushing this so much, and Hayley kept asking them to please explain what they were doing before they did something. It quickly became apparent that Hayley had torn, she had a fourth-degree laceration and needed to be sewn up and fast. 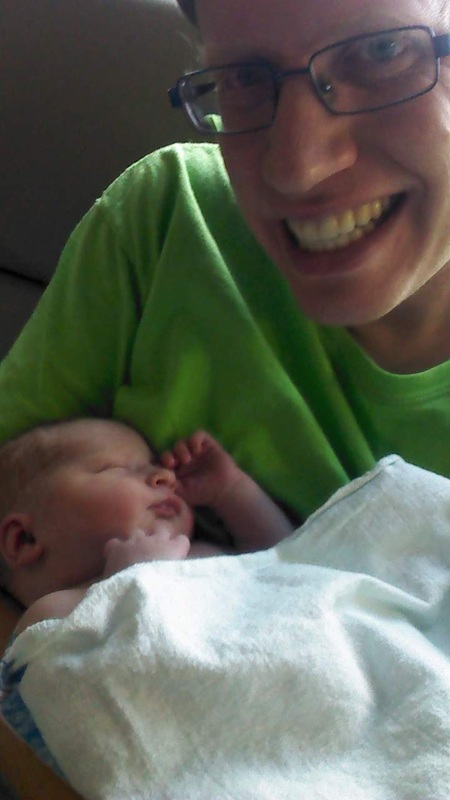 The baby was transferred to me so that I could do skin-to-skin. Thankfully one of the nurses saw how uncomfortable I looked (I had held precisely zero newborns in my time) and was able to talk me through a good way to hold him. He peed on me as I sat there while an army of medical professionals handled the surgery. There was a lot of blood on the floor of that hospital room by the time it was done, but everything happened so quickly I didn't have the wherewithal to be frightened. The rest of the day was a little tricky. Hayley had lost a lot of blood, though they decided not so much that she needed a transfusion, and was high on adrenaline, and she shivered fiercely despite being covered in blankets and the heat being cranked up all the way. By about dinnertime, though, we were finally transferred out of labor and delivery, into the postpartum wing, and we were beginning to experience parenthood. Like I said, I still don't quite know what to make of parenthood. I never know what to make of anything all at once, so I suspect it will take a lot of time and reflection for me to be able to say anything meaningful. I do know, though, that birth seems to be an incredible process, unlike anything else. H. G. Wells (yes, I can always bring it back to H. G. Wells) believed that women ought to be compensated for being mothers by the state, because it was the one disparity between the sexes that could never be rectified. Watching Hayley go through all this, it was hard for me to disagree, but I'm in position to pay her with anything other than love and admiration, and by being the best husband and father I can. * An early version of this post claimed it was my mother's idea to be there; she corrected me, "Actually, until it happened, I wasn't sure that I did want to be there."